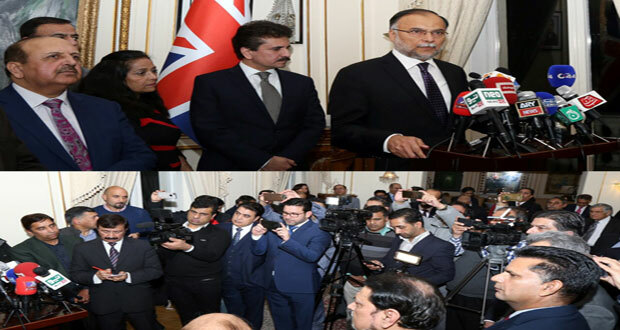 London (February 13, 2018): Defence Minister Ahsan Iqbal has said that Pakistan on the path of rapid economic development. Mr Ahsan Iqbal, Interior Minister of Pakistan has called upon the Pakistani diaspora to play their role in the economic development of the country. Pakistan is undertaking ambitious energy and connectivity projects which require building foreign exchange reserves. Overseas Pakistanis can make valuable contribution by developing connections between Pakistan and rest of the world to promote Pakistani exports and bringing foreign investment in Pakistan besides sending more remittances through official channels. He appreciated diaspora’s critical role in Pakistan’s development and progress, and invited them to take maximum advantage of new business and investment opportunities on offer in Pakistan. 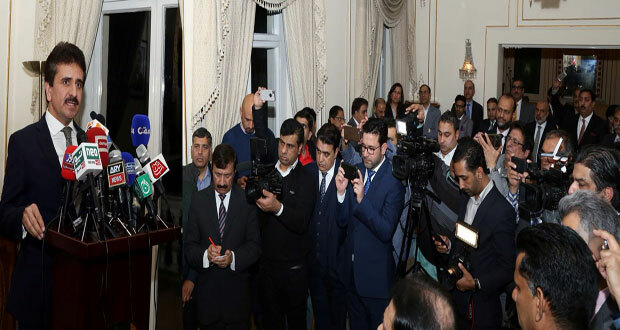 The Minister was speaking at a dinner reception hosted in his honour by the Pakistan High Commission, London where he addressed the members of the Pakistani diaspora and held a Q&A session with them. Giving an overview of Pakistan, the Minister said that remarkable transformation is underway in Pakistan, underpinned by the improved security situation, impressive economic growth and consolidation of democratic institutions. Four years ago the world was looking at us as one of the most dangerous places in the world, today Pakistan is looked at as one of the fastest emerging economies in the world. 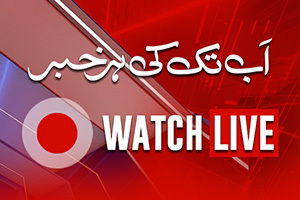 This is the real change government has brought about in Pakistan. Speaking about China Pakistan Economic Corridor (CPEC), the Minister said that it symbolizes the regional connectivity based development vision of Pakistan. He added that CPEC is an important part of the Vision 2025 of the current government which believes that economic integration of the region is critical for shared prosperity. “The economic growth of the country was 5.3% last year and we are expecting it to touch the figure of 6% this year. It was at 3% when the current government came into power. From 1947 to 2013, 18,000 MW electricity was produced in total whereas in the last four years, 11,000 MW electricity has been added to the national grid which has significantly increased our industrial growth. Out of the US $46 billion CPEC investment, US$29 billion investment has already been energized. Moreover, we are harnessing solar, coal, and hydel power generation resources. All this has set Pakistan on upward economic trajectory and made it an attractive destination for global investment.” The Minister assured the community of all possible facilitation at the airport, and safety of their investment in Pakistan. 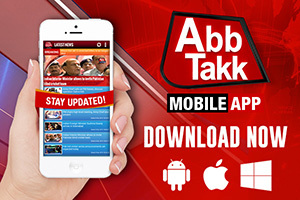 He further informed that government is considering re-starting POC for overseas Pakistanis. Similarly, the E-Visa service is also being contemplated for maximum facilitation to the overseas community, foreign visitors and investors, added the Minister. Acting High Commissioner, Zahid Hafeez Chaudhry welcomed the Minister at the High Commission. In his remarks, he commended the important role of the Minister in turning around the economy of the country. A large number of diaspora and representatives of media attended the reception. Earlier the Minister held a meeting with the British Pakistani Parliamentarians and discussed Pakistan-UK bilateral relations with them. He apprised the Parliamentarians that people of Pakistan are proud of their presence in the British Parliament and of the constructive role they are playing in strengthening bilateral relations.